Still on Cultural factor, checking organizational culture fit is not just enough, the candidate must fit into the culture of the environment where the venture is located. Sometimes induction and reorientation help in this regards, but this depends on the candidate’s willingness to accept other culture. This is why some people find it difficult connecting with customers in their new environment. They may be averse to the culture and unwilling to learn or adapt. These are extreme and radical people. You therefore need to ensure that the candidate profile fits into both organizational and environmental cultures. Language factor: Closely related to Cultural factor is language factor. Does the candidate speak both the business language and the locality’s language? How well can he converse both internally and externally? Can he easily learn the language? In case of expansion beyond the national frontiers, does he speak other languages that can be an added advantage? These are some of the relevant questions to answer before selecting a candidate. Finally, there is the sixth sense factor, but it is only used by those who by reason of use have their senses exercised to discern the right or wrong candidate. This is called gut feeling or instinct. As a leader, you need to develop your sixth sense, so that even after considering all the other factors, you can apply your sixth sense for final judgment. I wish you all the best as you make up your team. Today we will look at two more factors. Personality Factor: The person behind the person is more important than the person. That sounds confusing isn’t it? It sounds like a repetition but it is beyond that. Knowing the name, skills and experience of a person is quite different from knowing the temperament of the person. He can have a nice look and solid Resume but with a temperament ill-fitted for the role in mind. The real person behind every name is revealed by the temperament. If your venture is a customer facing type, you won’t want to recruit a shy and introverted person as your Front Desk staff. Front Desks are for people with outgoing dispositions, and the introverts are more suited for back office roles. It is therefore important to know the temperament of your candidates before you sign them on. How do they handle stressful situations? How do they handle pressure? Your screening test must be designed such that the personality of the candidate is revealed. Cultural factor: There are two aspects to the Cultural factor, these are Organizational Culture and Environmental Culture. It is important that whoever you are considering as part of your team fits into both your organizational culture and environmental culture. Cultural misfit can cause serious trouble for any venture. The candidate must fit into your organizational culture and also be able to adjust to the culture of the environment in which your venture operates. Some people excel in an environment devoid of too many rules, while some are process and rule oriented. You must ask questions that will reveal the cultural orientation of your candidates. We will pause here today and continue tomorrow. Every vision requires people to become reality, however you can’t choose those people based on sentiments. You choice has to be objective and be based on several factors including affinity of vision. People who have vision similar to your vision will likely be willing to work with you and they will work with passion. People of no vision usually lack passion, they are mostly driven by monetary rewards. Having them on your team may not help you because they wont see beyond the immediate returns. So apart from your own vision, you need to be sure the people you are selecting have visions and the visions are not diametrically opposite yours. 2. Skill Factor: You don’t want to have square peg in round holes in your venture. It is necessary you test those you want to include in your team for requisite skills. There are several ways to do this including interview, aptitude test, psychometric test, case studies, etc. Beyond technical skills, you need to test for some soft skills like relationship management skill, communication skill, how well can they cope under stress, and other skills can directly impact on the success of the venture. You are not testing to completely exclude some people. Some have basic knowledge and skills and have a ‘willing to learn’ attitude. Depending on the stage of your venture and availability of time, you can take on those with the attitude to learn and basic skills. Some have the core skills and can be engaged, subject to scaling attitude hurdle. In summary, skill factor is important and will help you have the right kind of people on your team. Don’t undermine the success of your venture by allowing emotions to rule your judgement when selecting your team. If someone doesn’t have it, the next question is can he be trained? If No, there is no need being emotional, even if you like the personality of the candidate, unless there is another area the candidate can be engaged. Until the door to a room is opened you cannot access the contents of the room, unless you break in. Sometimes we go shopping in malls and find some shops closed, maybe for the day or for some reasons. At such times, though we can see the contents of the shop through the glass, we can’t buy because the door is locked. Likewise in life, we often have what it takes for some positions or jobs or appointments but we don’t get them because the door has not been opened to us. No matter how hard you struggle, if the door is not opened you can’t get it. It is therefore important that we know the factors that can trigger a door to open. This will be the focus of our discussion in this series. 1. Integrity: One of the rarest attributes in our world today is integrity. It is this rarity that is largely responsible for failure of leaderships. Integrity is the quality of being honest and fair, or a state of completeness or wholeness. Integrity is also doing what is right whether you are being watched or not. Another word for integrity is honesty. It is a state of honesty of actions, intentions and words. Being true to your actions, intentions and words. In the race for wealth, many people have thrown away this rare and precious attribute. When people are being sought to occupy a position, integrity is one of the key attributes looked out for in the candidates for such positions. 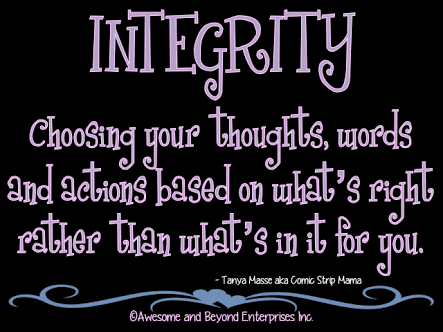 And integrity is not just something you own, it is something also perceived by others. You own it, but it is perceived by others. It is those who have perceived this in you that will recommend you for such positions. It may be positions you ordinarily would not have had access to or be aware of, but your integrity will make someone recommend you for the position. Integrity still opens doors and will keep opening doors, so you need to guard it if you still have it, or start repairing it if yours has been damaged. Yesterday I was observing my okro garden and I saw something that is worth sharing. I observed that some of the plants have grown taller and bigger than some others, even though they were planted the same day. It caught my curiosity and I began to meditate on why the huge difference. 1. Access to Water: I observed that the ones that are taller are closer to the source of water than the other,so they are growing faster than the others. Water brings life, and water can be likened to Grace. In our lives, we often wonder why some people seem to be moving faster than us. One of the reasons for this is Grace. Some people are just unmeritedly graced and they do things with ease. So instead of envying them, ask for Grace of Ease upon your life. So while we are diligent in our work, let us also ask for Grace and Right Positioning so that our journey through life will be easier. 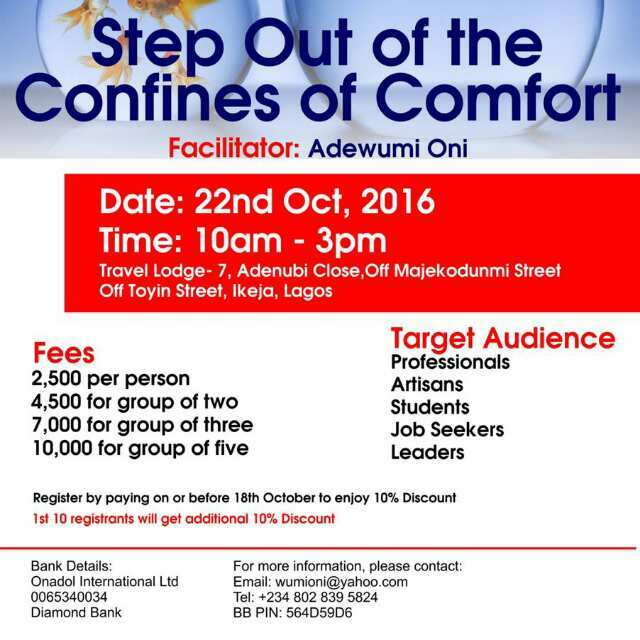 Registration for the ‘Step Out of the Confines of Comfort’ seminar ends today, ensure you book your place today. You may not know that where you are now is a confine of comfort. Information brings about reformation, which leads to transformation. The purpose of this seminar is to spur us from wherever we are to hunger and thirst for more. It is going to be fun, exciting, informative, instructive and inspiring. Let us meet at Travel Lodge next Saturday by 10am. Speaking with me is Mr Peter Oshinoiki, an entrepreneur per excellent. We are all vessels for different purposes and assignments. We are useful to the extent of being allowed to be used by and of God for the different reasons He created us. We are tools in the Hands of God. We are as useful as we submit ourselves for His use. Just as we have different vessels in our home, for drinking, storing, eating, washing, conveying, etc, we are also vessels of different types in the sight of God. Also, just as we have vessels of different materials, wood, clay, aluminum, silver, gold and other precious metals, you are also a vessel of a kind. In our homes, the importance attached to a vessel is usually a function of the make (wood, clay, or gold), its beauty, and the price. Some vessels are kept only in the toilets and bathrooms because they are plastic and of little worth. Some are reserved for special guests like our porcelains, China wares and golden cutleries. In the same vein, we can be reserved for special purposes and occasions, or just be among the crowds. While it is God who decides who plays special roles or general roles, you can influence God’s choice by your actions, words, thoughts, and choices. If you make God your first priority always, He will make you a special vessel for a special purpose. You can be a special purpose vessel or a general purpose vessel by your choice of whom to serve and follow. The choice is yours.